In an attempt to make a yummy but healthy and energetic treat for the crazy week that Wally and I have ahead, I went for this honey muffin recipe from Taste of Home. The only changes I really made were to use whole milk instead of 2% milk (I like using whole milk in my baking unless there is a specific reason not to) and to add a sprinkle of pine nuts on top. I really wanted to put pine nuts inside the muffins but I was not sure Wally was going to like that so I compromised by only sprinkling them on top, in a way that if he did not appreciate the pine nuts in a muffin he could just easily take them off. I personally loved the pine nuts! In a large bowl, combine the flour, the sugar, the baking powder and the salt. In a small bowl, beat together the egg, the milk, the butter and the honey and then stir the mixture into the dry ingredients. Bake for 15-18 minutes or until a toothpick inserted near the center comes out clean. Note: these muffins are better served warm. If you are looking for muffins with a strong taste, this is NOT the recipe for you. Wally thought they were pretty bland in taste. I like them because they were light and because the not so strong taste made them perfect to be spread with butter and/or jam (or nutella or any yummy spread you can think of), almost like a biscuit! I'm going to luv these muffins, I'm sure of it! My favorite thing to make are muffins and these with honey and pine nuts...perfect! These sound incredible. Thanks so much for sending the recipe I will definitely give them a go & let you know how I get on. I love pine nuts too, but never thought about putting them in a muffin, great idea! 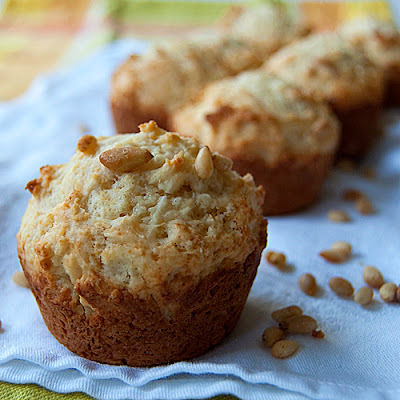 Pine nuts in muffins in a great idea. I always used them in pasta only. I love pine nuts! But, never put these together with muffin. Sounds super good. I don't think I've ever tried pine nuts, can you believe that? These muffins look like the perfect way to be introduced to them though! Ladies, it's funny to see how for many people pine nuts in a dessert are something weird or new! It is pretty normal in Italy. For example, they are the main component of the Torta della Nonna (a very traditional dessert). You should try them! Great looking muffins! love the addition of pine nuts and with the combination of the honey, yum! They look great! I love baking with honey. I'm always amazed when my husband says "You didn't use the orange blossom honey, did you?" I usually don't taste that much of a difference. I've also been using some spelt flour in place of some of the AP flour (maybe 1/2 cup?) to add a health boost! Cool idea! 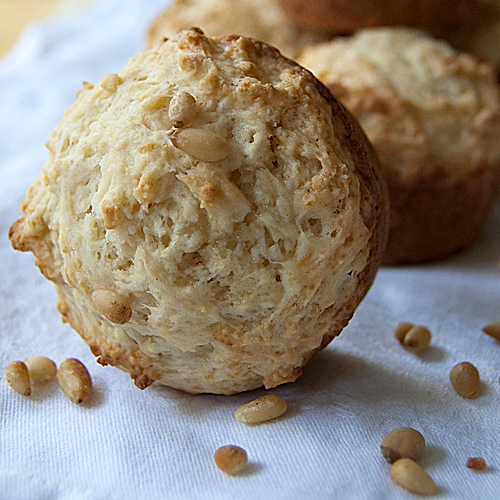 I love how the pine nuts can add a bit of earthy flavor and a good crunch to the sweet muffins. You are making me realize that I haven't made muffins in awhile either. This sounds incredibly creative. I bet the honey and pine nuts together make for a wonderful savory-sweet combo, which I always adore. Sooo unique. I can't even remember the last time I made muffins. These sound great and would be a refreshing alternative to my normal breakfast and snacks. Wow... what a great and interesting recipe. Wow! I can't wait to make these! Genius!